Clark Stationery - Embossed Graphics - Clarity Ensemble Script. For all EG Stationery choices click Embossed Graphics to go to our sister site to order. Item Name: Clarity Ensemble Script. For all EG Stationery choices click Embossed Graphics to go to our sister site to order. 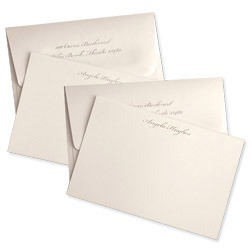 This ensemble features Group of 100 cards (50 medium and 50 large) embossed with elegant simplicity and accompanied by standard envelopes. Paper colors: White or Ivory. Size: Two cards: large cards: 4.8" x 7"; Medium cards: 4.5" x 6.2". Making it the perfect gift for anyone - even yourself! ald, Slate, Fuchsia, Purple, Mocha, Ocean and Sage. For all EG Stationery choices click Embossed Graphics to go to our sister site to order.